The most obvious example of the Advanced PSD Add-on usage is an application which builds business cards based on a PSD template. 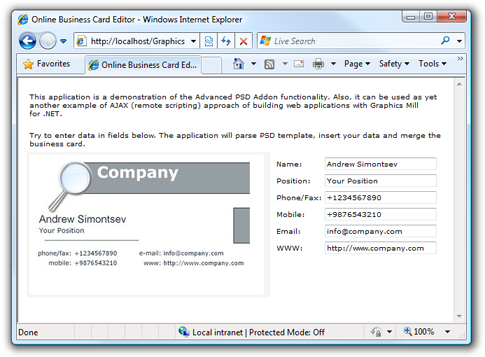 This topic discusses a web application which works in this way: the user enters their personal details and a business card is generated. When creating any artworks in Photoshop®, do not forget that Advanced PSD Add-on does not provide 100% PSD format support. Keep in mind that if some Photoshop® feature is not listed in the Advanced PSD Add-on overview, most likely it will be disregarded when you process PSD file. That's why it is strongly recommended not to use vector masks, adjustment layers, etc. If you cannot avoid using some of PSD features, feel free to create support case to discuss possible solutions. When we prepared one or more PSD templates, it high time to start building our web application. The first step is to design the user interface. 6 server Aurigma.GraphicsMill.WebControls.BitmapViewer controls which will be used to input user's personal details. Let's tweak parameters of the BitmapViewer. As our original template has high resolution it will be to large to be displayed. To make it loading faster and to reduce traffic, we will shrink the image displayed in the control. To do it, set the Zoom property to 0.35 (35%) value. To provide the highest quality during zoom operation, set the ZoomQuality property to High value. One more trick to speed up loading speed - disable the low-resolution preview image. Set the PreviewImageEnabled property to false. To avoid calculating and hardcoding width and height parameters of the control (to display the image without scrollbars), let's have the control to get these values automatically. It can be easily done using the ZoomMode. Just set it to the ZoomControl value. To optimize the performance, set the BitmapStateEnabled property to false. It will switch off bitmap state maintenance which is unnessary in our case (since we re-generate the bitmap during each page load). 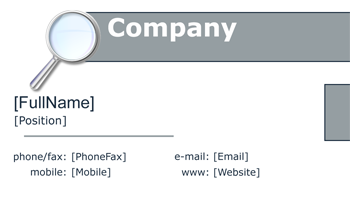 For distinctness sake, let's name our Input (Text) controls as follows: TextFullName, TextPosition, TextPhoneFax, TextMobile, TextEmail, and TextWebsite. The code which processes a PSD template and replaces placeholders by the user data, we will reuse the RasterizePsd method described in the Merging Layers topic. After the page will be loaded in the browser, you will see the ready business card. Add a server-side method marked with the RemoteScriptingMethodAttribute atribute. In this method we will just fill the texFields collection with updated text values and process the business card template again. You may noticed that text fields are accessed through the form rather than through the Value property of Input (Text) control (as it is implemented in the Page_Load). It is caused by the fact that the remote method is called before initialization of these controls. Such behavior is stipulated for optimization purposes to process the callback before initialization of all controls. It allows to eliminate full page initialization. This code may appear a bit tricky. To avoid executing our remote method too often, we force it to be called not more often than in 2 seconds since previous call, and not earlier than after 1 second after previous refresh.